As with every Western-backed conference assembled regarding Syria, dramatic fabrications revealed just ahead of proceedings are intended to give them and their predetermined outcomes both gravity and “urgency.” Upcoming “peace talks” to be held in Switzerland are no exception. A report cooked up by the unelected dictatorship in Qatar is based on an anonymous source, codename “Caesar,” and remains admittedly unverified. The report, by three former war crimes prosecutors, is based on the evidence of a defected military police photographer, referred to only as Caesar, who along with others reportedly smuggled about 55,000 digital images of some 11,000 dead detainees out of Syria. Rupert Colville, spokesman for UN human rights chief Navi Pillay, told AFP: “This report is extremely alarming, and the alleged scale of the deaths in detention, if verified, is truly horrifying. 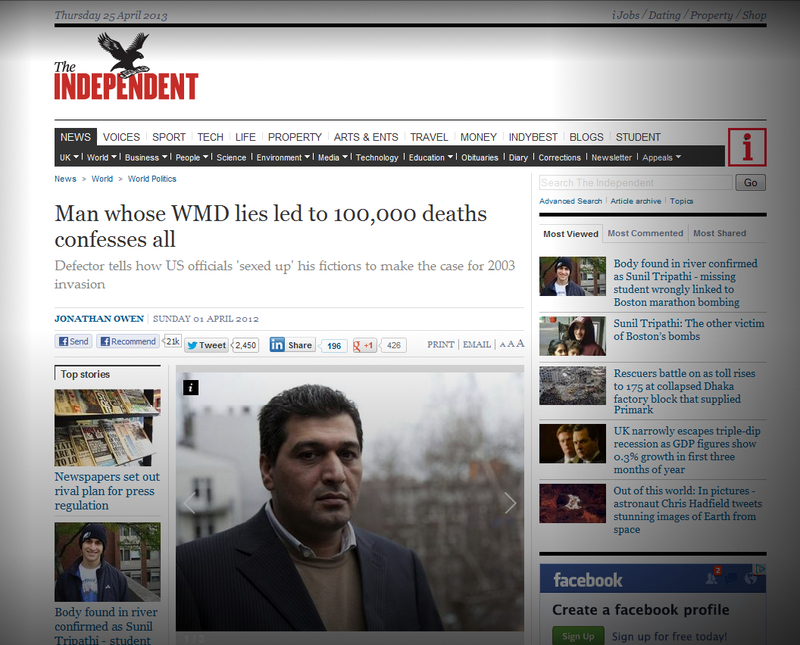 Image: From Independent’s “Man whose WMD lies led to 100,000 deaths confesses all: Defector tells how US officials ‘sexed up’ his fictions to make the case for 2003 invasion.” In retrospect, the corporate-media has no problem admitting the insidious lies that were told to justify the invasion and occupation of Iraq – the lead up to the war was another story. A verbatim repeat of these admitted lies are being directed at Syria amidst the West’s failure to overthrow the government with terrorist proxies. A man whose lies helped to make the case for invading Iraq – starting a nine-year war costing more than 100,000 lives and hundreds of billions of pounds – will come clean in his first British television interview tomorrow. “Curveball”, the Iraqi defector who fabricated claims about Iraq’s weapons of mass destruction, smiles as he confirms how he made the whole thing up. It was a confidence trick that changed the course of history, with Rafid Ahmed Alwan al-Janabi’s lies used to justify the Iraq war. It is now admitted that Al Qaeda comprises almost entirely all of the militants fighting the Syrian government, many of whom are foreigners crossing into Syrian territory with NATO’s aid.